After the chaos of wristband exchange last year, I was sure as hell determined not to be caught out again. 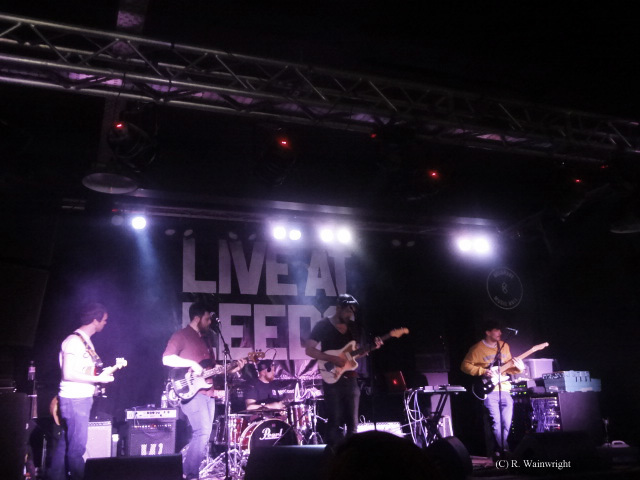 12:00pm saw the metaphorical starter pistol fired, bands ready to play the Live at Leeds all day event. There is something quite strange, but in a good way, about piling into a music venue at this time to witness a wide variety of music acts. In fact I ensure it is the bands who are playing earlier on the bill that I manage to watch. OtherPeoplesLives were the first band on in Belgrave Music Hall. Chosen as a new venue for this year, (and with an incredible food and drink choice may I add!) twisting up the darkened staircase opens up into what I can only describe as the ideal venue that Leeds has been missing from the map over the last few years. If you mashed together the atmosphere and sound quality of Faversham/Cockpit and Joseph’s Well together; well, you’re getting close. There’s more pressure than can be believed on a band at this time. Most people will amble to see the opening act, anxious to see if they are worth staying around for. To play to a venue at this time which was more a less full, is pretty daunting as well. This band didn’t care what time it was though. With a vocal tone similar to the likes of Editor’s Tom Smith or The Walkmen’s Hamilton Leithauser, combined with catchy, intense guitars, OtherPeoplesLives oozed pure post-alt-rock energy. Supported by the electronic, yet sometimes haunting, underpinning of the keys (the introduction of ‘In Berlin’ brilliantly showcases this) and the drumming intensity I was sure would obliterate the skins the acoustics in the room captured every instrument as the crescendo of noise increased within each song. More and more intrigued listeners made their way up the stairs, gradually filling in the traditional ‘Crescent’-shaped gap that seems to be created at the front of an audience who are caught in a moment of should /shouldn’t they be the first to stand on the front row. Executing a raw yet seemingly polished 30 minute set, OtherPeoplesLives undeniably set the standard for the Belgrave Music Hall. ← Previous Post What is the goal?